Cultivating the “way of water” is about learning strategies for yielding and blending with the one constant of life: change. While training Water method arts, you systematically learn, adjust and refine mind-body exercises to revitalise and energise your being. Since ancient times, people have used the Water method to heal from injury and illness, become incredibly healthy and develop the deeper, more subtle aspects of the Mind. I personally discovered the transformative, healing power of Water method arts after sustaining serious injuries from a motorcycle accident in the 1980s. My own healing journey led me to a passion for helping people gain insight into how to cultivate their mind, body and energy in ways that are effective and efficient, yet safe and sustainable for health and well-being…through all stages of life. Paul Cavel began teaching internal arts in 1995 with encouragement from his primary teacher, Taoist Lineage Holder Bruce Frantzis. In 2004, Master Frantzis named him one of nine senior students. Paul is the principal of The Tai Chi Space School, a senior member of the Tai Chi Union of Great Britain and a soft tissue and injury therapist (ITEC Level 4). For more than a decade, as a senior instructor & re-certifier in all his teacher’s available nei gong programmes, Paul has taught internal arts teachers in private group trainings with a focus on underpinning and improving teaching skill and embodiment of fundamental nei gong. He is now opening up his annual teaching curriculum to current instructors of all backgrounds as well as instructor-hopefuls! This book is designed to teach the fundamentals that drive and underpin training at all levels and stages of development, not a form. 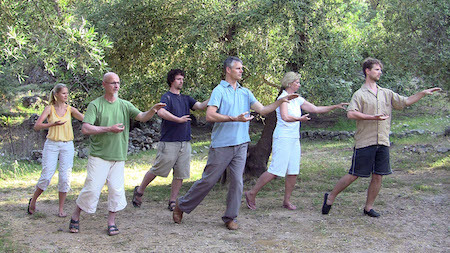 There are numerous books on forms packed full of diagrams and figures that largely only serve to confuse those trying to learn tai chi and qi gong because three-dimensional motion cannot be accurately portrayed by a series of two-dimensional images, and large gaps between moves prevent students from truly following along. The collection of principles included in the book, portrayed as illustrations and accompanied by brief explanations, are aimed at conveying how internal arts techniques function in ways that help you embed them and feel them come alive in your flesh. Internal arts training does not involve just thinking about or visualising concepts. Instead, the focus is on directly experiencing what is happening inside your body – no mental projection required! But of course you must have some level of understanding of what it is you are meant to do as a starting point. Pictures can give you a means for assimilating information without simply overlaying past experiences onto concepts that are actually brand new to you.